Good practice examples of how boroughs are tackling the causes and impacts of poor air quality. Improving air quality and tackling the health impacts of pollution requires collaborative effort from many different organisations. Whilst it is not something that London's local authorities can tackle on their own, they take the lead in delivering many different air quality projects, including those funded through the Mayor's Air Quality Fund. This page presents a small selection of good practice examples. More information on what boroughs are doing is available from their Air Quality Management Plans and reports. Any London local authorities with good practice examples that they think should be included in this list should contact Owain Mortimer. The London Borough of Camden along with LB Enfield and LB Islington have been working with private sector partners, including DHL, to deliver a “Freight Consolidation Service (FCS)” based from a facility in Edmonton, North London. The initiative has been supported by the Mayor’s Air Quality Fund. The service involves council suppliers delivering their goods to a Consolidation Centre, where they are grouped together into fewer onward deliveries. This can help to reduce pollution and congestion, as well as having other benefits. Suppliers have lower costs as a result and have passed these onto the boroughs by way of rebates. The business development activity has generated a healthy pipeline of new supply chains which are expected to come on-stream from spring 2016. 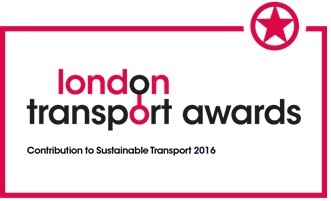 This includes a number of Central London businesses and organisations who are conscious of their own environmental footprint and wish to take positive steps forward. 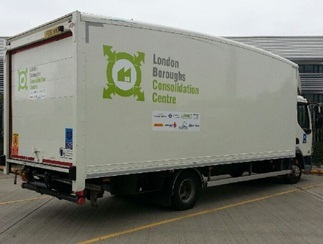 The FCS demonstrates the ability of boroughs to work together with private sector partners to deliver a scheme that raises awareness of logistics issues more generally. It has explored opportunities to promote more efficient in-house fleet operations, changed staff ordering habits, achieved better stock levels, increased order values for suppliers, promoted supplier consolidation and helped to resolve the issue of personal deliveries at work. A framework agreement for consolidation services has been provided by LB Camden for use by other public sector organisations on a UK wide basis. For more information on the Freight Consolidation Service, please contact Nigel Symonds at the London Borough of Camden (Nigel.Symonds@camden.gov.uk). 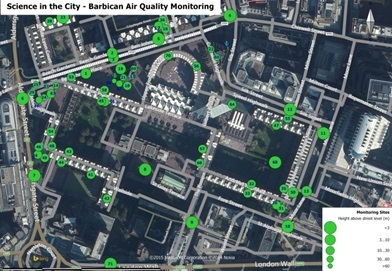 To increase public understanding of the causes and effects of air pollution, in 2013 the City of London Corporation commissioned “Science in the City” to initiate what they believed to be the largest, community based, citizen science air quality monitoring project to be carried out in the UK. The project focused on the Barbican Estate, with volunteers being recruited through residents’ meetings to take part in the monitoring of NO2 and particulate matter (PM2.5). This included monitoring directly outside of their properties and whilst they were moving around the City. The project provided the Corporation with informative results on local air quality, including more data on the distribution of pollutants across the estate and surrounding area. Whilst the interior of the estate was less exposed to poor air quality, residents in towers overlooking one of the local pollution “hotspots” (Beech Street) were found to be exposed to potentially harmful concentrations of pollutants, even at heights over 60m. The local community’s understanding of air quality and the actions that residents can take improved as a result of the project. Over 90% of respondents agreed that their understanding of the health impacts of air pollution had improved as a result of participating and 92% felt better informed about the work that the Corporation undertakes on air quality. 82% of respondents said that they would make changes to reduce their personal exposure to air pollution as a result of the project. Restricting access to certain roads so that only locals can use them. Banning certain types of vehicle, including old taxis, diesel vehicles and buses without catalytic convertors. Following the monitoring, residents engaged with local businesses with a view to getting their support for action to improve local air quality. Residents have also been involved in action days to deal with unnecessary engine idling. The support and interest in local air quality enabled the City of London Corporation to look into establishing a Low Emission Neighbourhood in the area. The monitoring data provided a useful baseline to assess the impact of future interventions. For more information, please contact Ruth Calderwood, Environmental Policy Officer at City of London Corporation (ruth.calderwood@cityoflondon.gov.uk). Many boroughs are complementing the new major cycling improvements (such as the Cycle Superhighways) being delivered by TfL, with their own local schemes to promote active travel. One such borough is the Royal Borough of Greenwich. The Council is investing in new cycling and walking infrastructure schemes to provide new “Greenways” to provide traffic-free links for pedestrians and cyclists, as well as new cycle lanes on the highway. 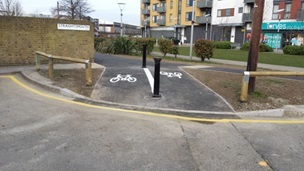 Significant improvements have been made to the Thames Path in the borough to make it more cycle-friendly. The Council has also focused on its town centres, with regeneration schemes aiming to make these more attractive places for cycling, walking and public transport use. Greenwich Council is also one of the many London boroughs implementing 20mph zones on a substantial number of its roads. 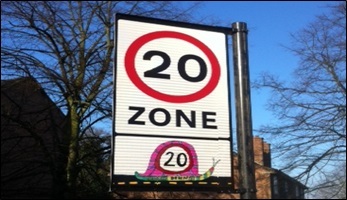 Around 70 per cent of residential roads are now covered by 20mph zones and the Council is committed to implementing more. The Council’s investment is showing results. It reports that cycling has increased from 0.9% of all journeys in 2011 to 2.3% in 2015. Cycle flows on the Thames Path increased by 20% in two years. To find out more, please contact Sam Margolis at the Royal Borough of Greenwich (Sam.Margolis@royalgreenwich.gov.uk). 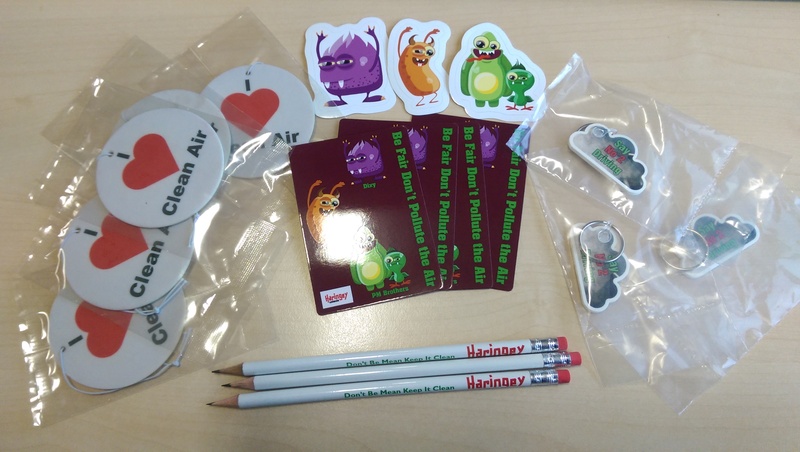 In 2014 Haringey Council endeavoured to raise awareness of air pollution and associated health issues and encourage behaviour change amongst local residents. One project developed to help achieve this was to work with primary schools to educate pupils about air pollution and actions that they can take to tackle the issue. Working alongside the School Travel Plan Officer, an Air Quality Apprentice at the Council overcame the challenge of educating school children about the pollutants that cause poor air quality, the health impacts and what they can do to help improve the situation. The Air Quality Apprentice developed the “Air Monsters” – “Nixy NO2”, “Dixy CO2” and the “PM Brothers” – Phil (PM10) and Mitchell (PM2.5). As well as a presentation tailored to the students, there are pop-up banners of each “Air Monster” which provide a visual stimulus, which proved helpful as air pollution can’t typically be touched, seen or smelt. The characters provide a basis for discussing the health impacts that the pollutants can cause. A fourth character, the “Zero Hero”, promotes walking, cycling, public transport and even “scooting” to school. Children have made their own “Air Monsters” in art lessons, whilst other lessons explore the science of air pollution. Some pupils have even written to The Mayor of London about their concerns around poor air quality and were thrilled to receive a reply. Such engagement will help these pupils take the air quality message throughout their life and hopefully influence their travel choices as they grow up. In the first year, the Apprentice delivered her presentation to 28 schools and 6495 pupils in Haringey. The assemblies were well received by students and over 50% pledged to become Air Quality Rangers, responsible for maintaining air quality noticeboards in the school. Engaging with the School Travel Plan officer has also helped schools achieve or improve on their “Sustainable Travel Active Responsible Safe” (STARs) rating, which in turn has some bearing on the school OFSTED evaluation. For more information please contact Haringey Council at Pollution@Haringey.gov.uk. The City of London Corporation has identified idling vehicle engines as an unnecessary source of NO2 and particulates emissions. To tackle this, it has implemented a scheme that combines enforcement, through Civil Enforcement Officers asking drivers to turn off vehicle engines and issuing Fixed Penalty Notices if they do not, with a number of positive behaviour change initiatives, such as writing to companies with drivers that leave engines idling. 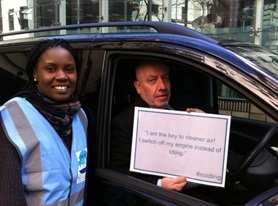 The Corporation worked with the charity Global Action Plan to develop a Cleaner Air Action Days campaign to engage with drivers in the area to raise the importance of preventing engine idling as a way of reducing air pollution. The campaign also raised awareness of the benefits for drivers, such as saving money on fuel and reducing wear and tear on the vehicle. Air Quality Wardens were deployed in the City to talk to drivers that left their engines running while they were stationary for more than 60 seconds. The wardens explained the harm that leaving engines running was doing to the local air quality and the health of residents, workers and visitors. They used a “myth-busting” guide to educate drivers, which included busting the myth that turning off and restarting an engine after 60 seconds caused more pollution. City Air air-fresheners were given to drivers that switch off their engines. Drivers that had already switched off their engines were also thanked for their contribution to tackling poor air quality in the City. Social media was used extensively to raise awareness of the Clean Air Days. “against a target of 250-500, the Cleaner Air Action Days campaign saw 512 drivers switch off their engines during the two days of activity, saving an estimated 0.09 tonnes of carbon emissions equating to 350 litres of fuel”. 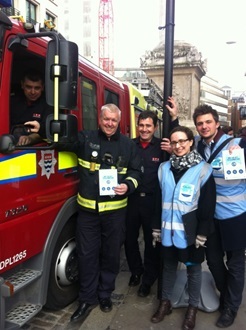 36 businesses based in (or with operations or sites in) the City of London signed up and pledged to support the campaign by asking their drivers to switch off during the action days, far exceeding the target of 10. London’s first rapid on-street electric vehicle charging points, which can fully charge a vehicle in less than 30 minutes, were launched in July 2015 by Hackney Council. The three publicly-available 50kw devices are located in Hackney’s main town centres: Bentley Road in Dalston; Calvert Avenue in Shoreditch; and Reading Lane in Hackney Central. Vehicles will fully charge within half-an-hour compared to between three and four hours when standard units are used. 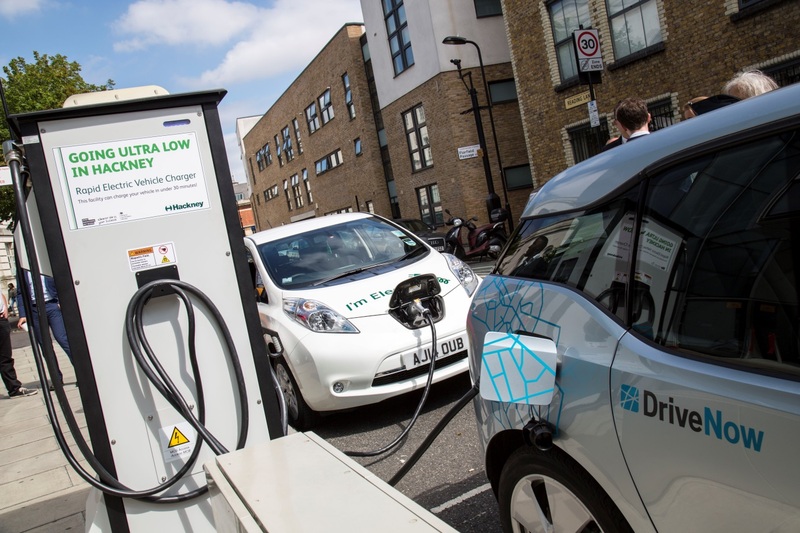 Hackney Council is committed to improving air quality in the borough, including supporting the development of electric vehicles both locally and across London. It hopes this network will make charging more accessible, efficient and practical, in particular enabling electric taxis and private hire vehicles, as well as other commercial vehicles such as those used by courier companies, to recharge during the working day. It is also hoped that the network will help support the expansion of electric car clubs in the borough. These can help to reduce emissions and vehicle ownership, which, in turn, can reduce parking pressures and allow road space to be given over to other users, such as cyclists and walkers. There are around 300 charges across the three units per month. This equates to approximately 3+ per day per charger, which is considered to be a high volume. There have been 44 different users registered. 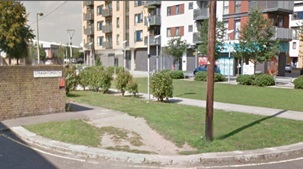 As part of Haringey Council's commitment to improving air quality, green screens have been installed at schools adjacent to main roads in order to help reduce the exposure of young children to poor air quality during playtimes and to raise awareness of poor air quality caused by traffic. Three green screens have been installed to date. 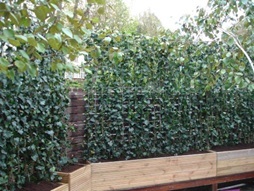 Certain vegetation can absorb pollutants and the screens can interrupt the flow of dirty air to reduce the levels of pollution in the school playgrounds. The screens have other air quality-related benefits. They can help to raise awareness of the issue amongst school children and promote the benefits of a healthier environment to children and parents. This can lead to better engagement with other air quality actions, such as the development of new school travel plans.